I take great professional pride in my work as an accompanist and performance coach. I particularly enjoy working with singers, and am able to give advice on style and performance. Whilst living in Cambridge I lectured for Lieder accompaniment. I regularly work with Nottingham University music students and have accompanied professional singers here and abroad. I have been official accompanist in international courses and master classes. I have played for violinists and cellists and run several professional ensembles. I accompany for concerts and public performance, and can coach and accompany for exams and diplomas. One of my particular interests is the bringing together of pianists in 6 and 8 hands ensembles. Wherever I have lived I have created multi-piano groups; most recently the Derby Piano Quartet, 8 hands on 2 pianos. 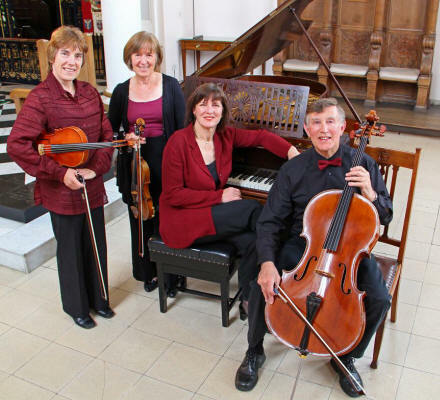 I am an enthusiastic chamber musician, and am currently part of the Attenborough Piano Quartet, and the Mercian Piano Trio. Accompanying Schumann Fantasy Pieces, with Nick Stacey on clarinet. Accompanying Spanish soprano Maria Escobar, in a programme of Arias, Lieder, and songs from her native Catalunya. Accompanying Richard Roddis, Dichterliebe, St Mary's Wirksworth, March 2011. A teachers' piano ensemble rehearses at the Cardona piano workshop, Spain, July 2011.
with Helen Wallace (flute), Nick Stacey (clarinet), Ian Stockoe (bassoon), Simon Locke (horn), and Caroline Morgan (oboe). Now that the version of Brahms's German Requiem with piano duet has gained a toe-hold in the repertoire, Mozart's Requiem could well be next. Beethoven's pupil Carl Czerny made a four-hands reduction of the orchestral score which was published by Anton Diabelli; this is believed to have been its UK premiere. Any doubts that a 26-strong chamber choir could do justice to Mozart's vision were quickly dispelled. The pace and immediacy the choir, piano duettists Gillian Bithell and Beate Toyka, and conductor Malcolm Goldring brought to the performance made a refreshing change from the monumental grandeur we often hear, and threw a fascinating new light on such a well-known work. After an imposing opening chorus came a fast but totally effective Dies Irae, a Confutatis with both bite and more ethereal qualities, and a propulsive Offertorium. But there was lyricism where called for, too – in the Hostias and Benedictus, for instance. The solo parts were shared out very effectively among members of the choir. In the first half we were invited to compare four settings of Ave Verum Corpus, but given the nature of the text there is only so much acomposer can do with it. Byrd and Mozart were first – lovingly-shaped, even over-romanticised. The account of the setting by Saint-Saëns seemed more straightforward, perhaps because the style of performance was simply a better fit with the music; the piece itself was a pleasant discovery. Philip Stopford's 2007 setting is an attractive work in a sub-Eric Whitacre-ish style. In between these pieces came two piano duet works – Mozart's G minor Variations, K501, delightfully characterised, and Schubert's Allegro in A minor, D947, rather fancifully entitled 'Lebensstürme' (Life's Storms), played with drive and vigour. This goes straight into my Pick of the Year shortlist. Mike Wheeler. http://www.thisisderbyshire.co.uk/Review-Sitwell-Singers-Derby-Cathedral-29-9-12/story-17042609-detail/story.html Downloaded October 16, 2012. "The version of Brahms' German Requiem with the orchestral part transcribed by the composer for piano duet has been receiving some attention lately. As the Derwent Singers' performance showed, it can be a deeply satisfying experience in its own right, not merely second best. Sensitively partnered by Beate Toyka and Clive Pollard, the choir produced a remarkable range of dynamics, with no lack of power at climaxes. There was plenty of muscular vigour in the fugal sections, and conductor Richard Roddis' steady tempo gave the fourth movement a radiant tranquillity. Soprano Caroline Palmer and baritone Jeremy Leaman were the eloquent soloists. Mike Wheeler. http://www.mvdaily.com/articles/2009/03/derwent.htm. Downloaded July 27, 2011. "While all over the Rhineland Carnival was in full swing a surprisingly sizeable audience had assembled in the Endenich Trinitatis Church (Bonn) to listen to the Spanish singer Maria Escobar and her German-British accompanist Beate Toyka. Described by Thomas Quasthoff as outstanding the singer’s programme span a large frame from the classics to Roger Quilter. With wonderfully warm and beautifully nuanced voice Escobar succeeded effortlessly to fill the Trinitatis Church and give each song its individual character. As in Franz Schubert’s “An den Mond” or the “Shepherd on the Rock”, which was played here in an arrangement for flute rather than clarinet by Ursula Grote-Möhring. Pianist Beate Toyka who showed herself from her best soloist side with 3 of Chopin’s Etudes was as an accompanist reliable and in the background. She honed her skills to Escobar’s service, despite having to struggle with an out of tune grand piano. However, “Ah, je veux vivre” from Charles Gounod’s Opera “Romeo et Juliette” or the 3 Lieder from “Des Knaben Wunderhorn” by Gustav Mahler showed the interpretative power of this well balanced duo. The songs from the Singer’s Spanish home provided local colour and a good atmosphere." "Beate was astonishing. She seemed to comprehend the orchestral colours and then translate them into pianistic virtuosity. It was quite dazzling and seemed to confirm my theory that good accompanists make good shows." on a performance of Haydn's Creation with piano orchestral reduction; David Slater. "You were super, Beate! It's always a joy to work with you ... you are so sensitive. We LOVE having you!" after Bach 'Magnificat', Sitwell Singers, Derby; Malcolm Goldring, Musical Director, March 2014. "Thank you so much for your involvement on Saturday. As always, it was a dream working with you! I do hope we can do it again very soon." after Puccini Missa di Gloria, Sitwell Singers, Derby; Malcolm Goldring, Musical Director, February 2015.